Famous place Kutná Hora. The historic center of town conservation area, along with St. Barbara and the Church of the Assumption of the Virgin Mary in Sedlec since 1995 UNESCO World Heritage Site. 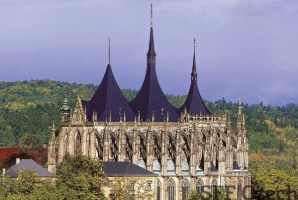 Town of Kutna Hora is a member of the European project EUROMINT, which aims to gather information on all European medieval. Famous Castle Konopiště founded near his family residence Benes probably around 1294 Prague bishop Tobias from Benes and using the model of the French forts. In 1887 the chateau was bought with the whole estate from the Lobkowicz Franz Ferdinand d'Este. High Gothic castle Karlštejn founded in 1348, which has a unique position among Czech castles. 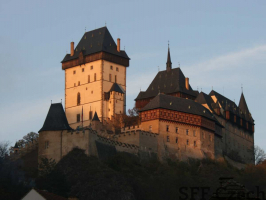 It was built by Czech King and Roman Emperor Charles IV as a place for safekeeping of the royal treasures, especially Charles's collection of holy relics and the coronation jewels of the Roman Empire. 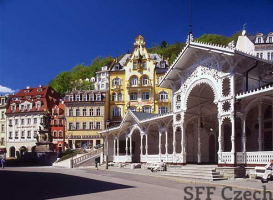 Famous Spa Karlovy Vary lies in West Bohemia at the confluence of the Teplá River and the Ohře River, about 120 km west of Prague. 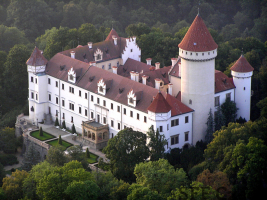 It is the largest and best known spa city in the Czech Republic. The city was founded in the 14th century by Charles IV. Český Krumlov, a UNESCO World Heritage Site, is a lively, cosmopolitan town with a unique atmosphere surrounded by unspoiled countryside. Dominated by a Castle stretching over the meandering Vltava River, Český Krumlov's narrow cobblestone streets wind along romantic nooks between patrician houses.